Although I’m not a huge fan of veggies, zucchini is such a comfort food of sorts for me. My grandfather passed away when I was 5 years old, and although I was young I was still old enough at that point to have some great memories of him. One is of him bouncing me on his knee and singing a little ditty to me in Italian. Another is of him and my uncle taking my cousin and I to the local park to fish and feed the ducks. Among some others, my absolute favorite memories are of him in his garden. He had a sprawling garden and grew countless vegetables: among those I remember are at least five different varieties of lettuce, spinach, peppers, green beans, tomatoes, onions, zucchini, squash, and every type of herb you can imagine. I used to “help” in the garden by putting one of my baby feet on his shovel when he was digging. I can vividly recall my mom and grandma going out to pick beans, tomatoes, and lettuce; when they came back in the kitchen would be dancing with the smell of fresh garden produce. Such an amazing smell! Now, as anyone who grows zucchini knows, once it gets going, you have zucchini coming out of your ears! My grandma has a stash of zucchini recipes in her collection that took full advantage of the garden bounty, and this is one of my absolute favorites. 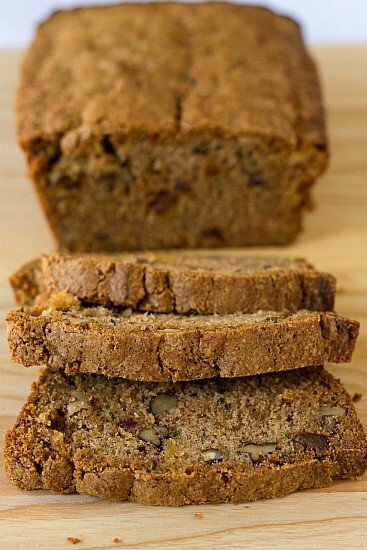 As most zucchini breads are, this one is extremely moist, thanks to the combination of zucchini and the pineapple. And it’s a fabulous flavor combination as well! 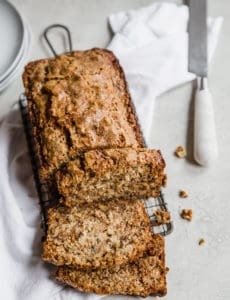 In addition to the pineapple, there are also chopped dates and walnuts in this bread. I love, love, love dates so that automatically makes this bread one of my favorites. When I was younger I loved to eat a slice of it slathered with cream cheese. Breakfast of champions! Although I didn’t know him for very long, I think my grandfather would be proud of the interest I have taken in gardening (even if it is only containers at this point), and the love I have for enjoying truly good food. I wish he were still here so we could hang out in the garden together! 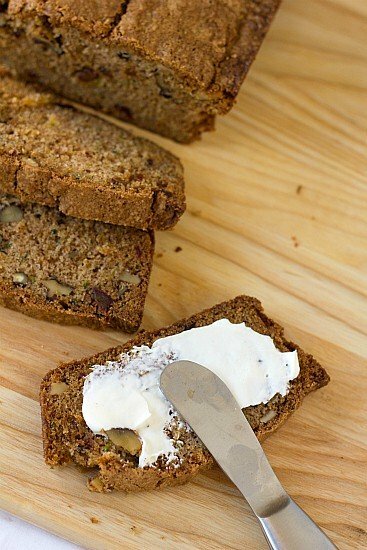 As most zucchini breads are, this one is extremely moist, thanks to the combination of zucchini and the pineapple. And it's a fabulous flavor combination as well! 1. Preheat oven to 350 degrees F. Butter two 9x5-inch loaf pans; set aside. 2. In a medium bowl whisk together the flour, baking soda, cinnamon, salt and baking powder; set aside. 3. In a large bowl, mix together the sugar, oil, eggs and vanilla extract until thick and combined (I used a hand mixer on medium speed, you could also use a whisk with a lot of elbow grease). Add the flour mixture and mix on low (or with a wooden spoon) until combined - the batter will be very thick. Using a spoon, gently stir in the zucchini and pineapple until evenly distributed. Lastly, stir in the chopped dates and walnuts. 5. Cool in the pans for 10 minutes, then turn out onto cooling racks to finish cooling completely. Hi Pamela, I do not peel it. Enjoy! Going to make this tonight to share with my mom and her lady friends. 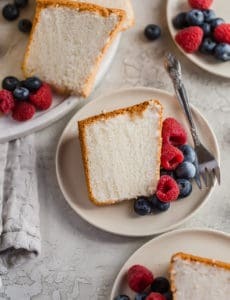 I read some of the reviews and it mentions a photo, just wanted to let you know there is no longer a viewable photo attached to this recipe and when you try to “Pin” it you get an error because of the missing image. In the links listed after the recipe, I clicked on #2, #3 and #8 and was sent to a page with your banner across the top but instead of a recipe I got a “sponsored list”, of which none of the choices were your site. I was looking for the particular recipes I clicked on. If I wanted a whole list I would have Googled zucchini. I will not be back here for you to waste more of my time! Could fresh pineapple be used instead of canned? If so, how would go about prepping it? Hi Lindsay, I don’t see why not. 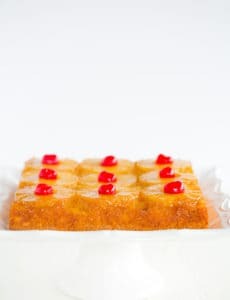 I guess I would finely chop the pineapple, mash it up a bit, then measure out 8 ounces of pineapple with its juices (since that’s what you find in canned), then drain it. Can one (1) cup of unsweetened applesauce be used instead of the oil? Yes, you could, however, I’m not sure how it would affect the taste/texture. This sounds like a great combination, and healthy as well. I don’t share your love for dates so maybe more nuts for me! This is the exact recipe I use. It is the best. I have actually made 2 batches this week!! This looks awesome Chelle. I would have never thought to combine pineapple and zucchini. I will definately have to give it a try as soon as my in-laws garden is overflowing with zucchini.